This book was really good! It started off a bit slow, but I think in the end getting the complete history of the characters and city was well worth it. I am eagerly anticipating the next novel about August, Kate, and the monster menagerie we were introduced to here! 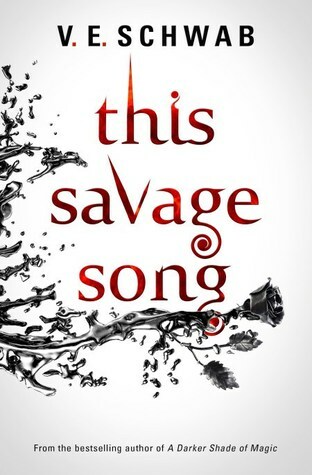 When I picked up This Savage Song, I had only read one V.E. Schwab book before (A Darker Shade of Magic) and I really enjoyed it. So, I went in with some pretty high expectations for this book. And yay! I was not disappointed! Officially, I’d say that I give it 3.5 stars and I was really, really on the edge of giving it 4, but it had a little bit of a slow start that dropped it just slightly for me. At first, I was a little tired of the long, drawn out introduction to the characters and the history of the world. It think I was just impatient to get to the gritty, gruesome action that I knew was coming. But, once I became immersed in the setting of Verity, a dark and deadly metropolis, I definitely appreciated the complete intro that we were given. And, the action I was waiting for picked up as the book went on. As for the characters, overall I really liked them. They were not one dimensional and they each had many different facets, not seen at first glance. It added to their humanity and depth, even the monsters. August Flynn was pretty angsty throughout the book, which got a little bit tedious, but I guess it is understandable considering his situation! He was still quite complex and interesting to read about. I enjoyed his sense of family loyalty, and strive to understand life and his place on earth. Kate Harker started out a little bit annoying, just a tad too “rebellious and edgy,” but it didn’t last very long. I admired her strength and resourcefulness. It was so good to watch her transition from craving her father’s love no matter what, to rejecting it when she realized he was a terrible person. Because he was a terrible person. He and his monsters were not quite as frightening as I expected (I had a different idea of monsters in my head before I started reading, I guess), but I loved the brutality of it all. Verity is a ruthless, bloody, and underhanded place for sure. August’s family is also equally as important to the story, as they are one side of the civil war that is tearing Verity in two. There is a clear divide in the city between the Flynns and the Harkers, and each side thinks that they are in the right. Every character we were introduced to was well rounded and added something to the story. I especially liked August’s dreamy sister Ilsa, because she reminded me of Drusilla from Buffy. The monster lore was very cool! It was different and clever to limit the monsters to only three kinds and create a method of how they each came to exist. The Sunai, Corsai, and Malchai are all quite different, but they each harbor some terrifying power or bloodlust. The history and background given to them was interesting to read about. I also loved August’s true form, and how his kind used music to incapacitate and kill their prey. Super creepy! The markings on the Sunai was another little detail that really brought the concept to life and made it feel legitimate. It’s such a unique idea! The relationship between Kate and August was so much better than I anticipated, I am thrilled to say! Of course, when two characters (of opposite genders) are posed as separate narrators, you get a pretty strong sense that they will end up coming together. Usually in a romantic sense. So, I was expecting them to be a thing from the get go. However, it was not at all how I thought it would be. I really thought the whole high school aspect would be lame and probably cringey, but it wasn’t bad at all. And, the relationship that I was mildly apprehensive about turned out to be an authentic and fulfilling slow-burn friendship. Yeah, there are hints that it will be more in the next book, but it was not rushed at all! I loved it! Kate and August’s interactions (a bunch of bickering, bonding, reluctantly protecting each other) were great to read. All in all, this was such a unique and intriguing idea! The writing was very strong and it provided a fantastic foundation for the next installment of the duology. Much of the writing, the dialogue, metaphors, imagery, and themes, were beautifully done. There is a depth to this book, too, that touches on big-life concepts. I really enjoyed the almost philosophical nature of August’s many inner monologues. And, paired with that, was Kate’s cynicism. It was engaging and effective, when read together. I am quickly becoming a big fan of V.E. Schwab! I cannot wait to get my hands on the next book, Our Dark Duet, and I would have read it already if I wasn’t waiting for it to be released in paperback. My set has to match! Maybe I will have to visit the library and check it out though! What did you guys think of this one? Cake, any thoughts on our monsters? I don’t know about you, but I am not going anywhere near that town! A cat knows when to lay low. Thank you all for sticking with me and happy reading!